A “splurge” on any eating plan is a must to keep you from feeling deprived. The secret is to limit those splurges to a very few times per year. A birthday warrants special treats so it is easy to plan ahead. And this one is worth the wait. By the way, Wheel’s sister shared the secret recipe for pie crust – come a little closer and I’ll let you know too. Buy it ready made at the grocery store – shhhhhh. If you want to use your own secret recipe for pie crust, as Wheel’s mother and grandmother did, please do, but I honored the new family tradition. You can cut the butter into the dry ingredients for the topping with a fork, but I really recommend a pastry cutter. I don’t have many specialty tools in my kitchen and don’t make a lot of pastry, but this is one piece worth having because it is so much faster. Resist the temptation to add cinnamon to the recipe – at least until you’ve made it with just the nutmeg at least once. The ever so subtle flavor of the nutmeg enhances the peaches sublimely! Happy Birthday, Wheels! 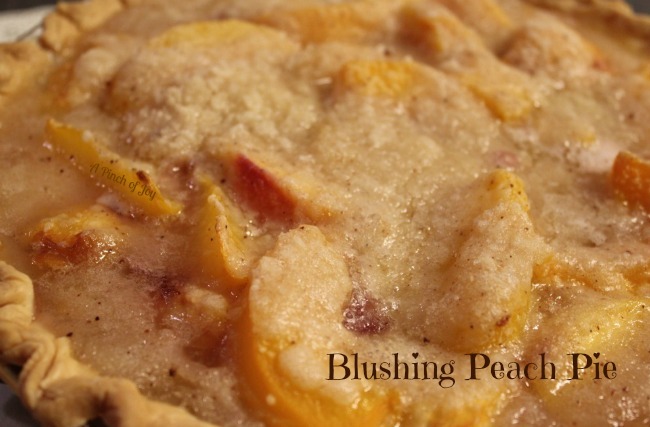 Delicious peach pie with a nutmeg struesel topping. Wheels favorite! Line 9 inch pie pan with crust. Place half the flour mixture in the bottom of the pan. Add the sliced peaches. Fresh, frozen or canned (drained) all work well. Put the remaining flour mixture on top. Bake at 375 for 40-50 minutes until crust is golden and top looks “set”. Approx 33 carbs per serving. My mom used to make a great peach pie. Yours looks fabulous and I can almost taste it! We just love a good peach pie and yours looks so delicious, I can almost taste it. Thank you so much for sharing your wonderful recipe with Full Plate Thursday. Hope you have a great week end and come back soon!